saturday madruga birando morning police owing to hay\'e is bay at one caso of hincamento at nijhoffstraat, san nicolas. at they arrival they owing to solicita presencia of ambulance p’e person injury. t’asina cu one man cu had one hinca at his braza owing to declara cu the mother of his child owing to atake cu one cuchiu, because the is cu another muher, but the hinca here not was nothing earnest. the muher owing to being deteni y had one clip also at his pols, but not was nothing earnest. n’e sitio while police was atendiendo the caso, owing to start one discucion among he y one another person y of ripiente others of the district also owing to cay inside where owing to start one bringamento y moketenan owing to cuminsa zwaai in y for of all direccion. the two agentenan policial they only not can owing to controla the situation, because they was mucho person y for re-establece ordo the agent owing to hay’e is saca his arm reglamentario y los tiro of advertencia y so owing to succeed place the two hombernan principal in the asunto here at waterpas. for suavisa full the asunto owing to dicidi cu will is mihor p’e man cu owing to being hinca hibe centro medico. one rato after the bululu owing to go back cuminsa at centro medico hour the are cu owing to stay behind owing to descend bay centro medico. saturday madruga police is ricibi informacion of cu have one car cu owing to cay in the rooi at good-bye. 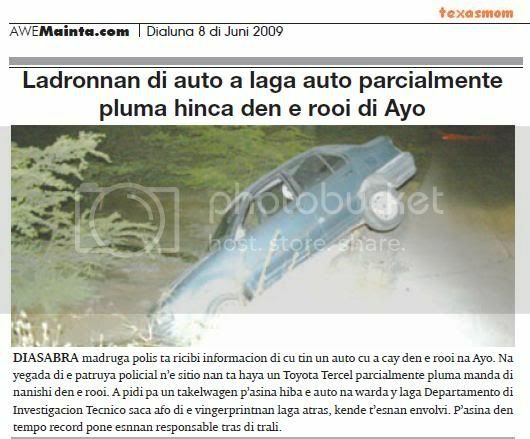 at arrival of the patrol policial n’e sitio they're achieve one toyota tercel parcialmente pluma send of nose in the rooi. owing to ask for one takelwagen p’asina take away the car at keep y let departamento of investigacion tecnico saca afo of the vingerprintnan let behind, that t’esnan envolvi. p’asina in time record place esnnan responsable behind trali. 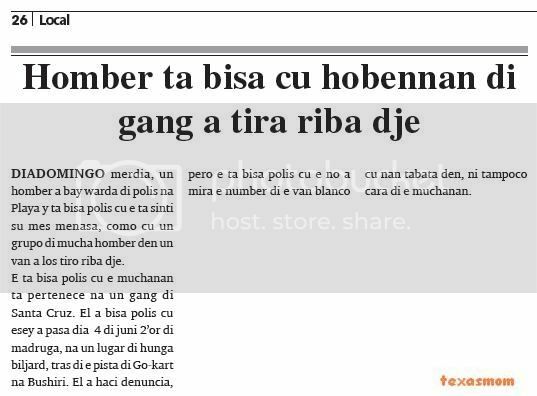 diabierna madruga for 5.30, at instant cu police was patrol in weststraat, height of one nightclub, they're see one man is stop urina near of his car, cu was toca very duro. while cu police was talk cu he, one another man f.g. naci at aruba of 22 year owing to bay on polisnan at one as enough fresco y grocero y was menasa the polisnan. past owing to tell the polisnan cu the is of rancho y the is corda they cara. police owing to bise bay for of the sitio, but the does not hear y owing to push hand in cara of one police female. the police owing to pushe y by cu the was sober, past owing to cay. his primo cu was eynan owing to bise p’e bay cas, but the does not hear y owing to follow menasa haci fastioso. police owing to bay for detene, but past owing to resisti pisa. while cu police was try hinke in car, the primo owing to come stroba trabao of police. past owing to achieve one klop y owing to bay for of the sitio. two another man on bromer also owing to come y owing to try of stroba police of detene f.g., but police owing to succeed hinke in car y owing to hibe keep, at where past owing to stay close. 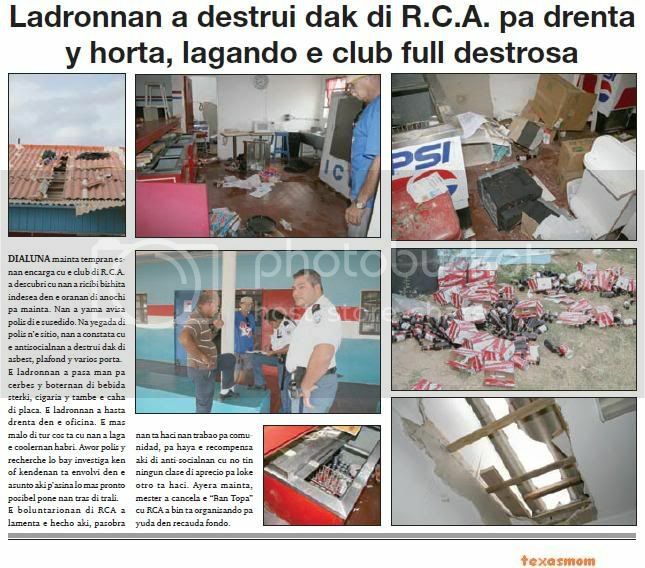 monday was one day dark for world deportivo at aruba, tanto the cede of rca because; piscina olimpico owing to wordo destrui for comete ladronicia or vandalismo. the damage material is conciderabel. question is if lotto will sponsor the reparacionnan? or door some another concierto have prioridad? are you ask about do you self, pakico have person wanted haci damage at property of another. 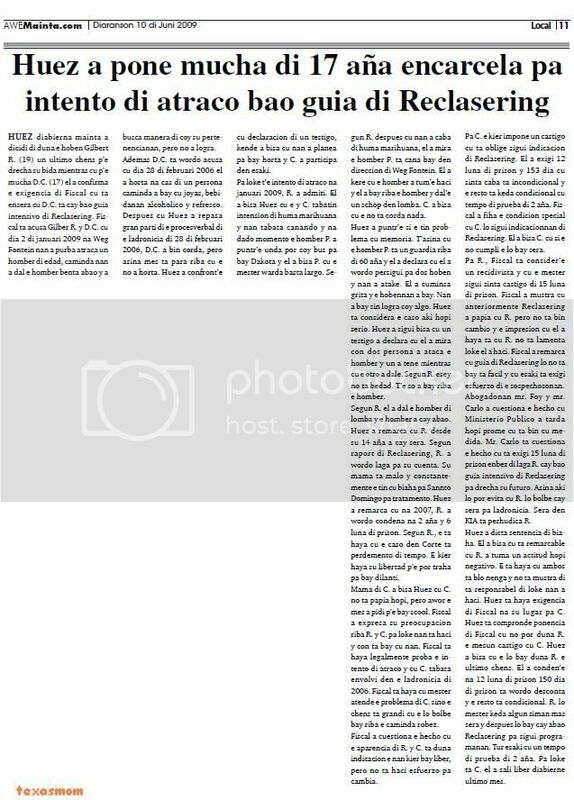 yesterday morning, we owing to being informa cu piscina olimpico, roly bisslik at savaneta is become victima of ladronicia. still we can corda, con after of the competencianan of carifta, cu ladronnan owing to enter y bay cu coin of throw of the day encuestion. the day ey ladronnan owing to bay cu on 4 thousand guilder for of the club. yesterday morning, hour cu the personal owing to arrive for haci they trabao, owing to constata cu in end of week again they owing to achieve visit indesea y where the trip here owing to bay cu the “safe” completo. in the box strong the trip here had only 300 guilder of “los geld”. have to owing to clip cadena of the door of iron of the bathroom for enter y so steal the box strong bay cune. esnan cu owing to haci this, not likes haci trabao boluntario y is for break all thing another is haci good. monday morning owing to enter informacion cu one car cu is show of owing to being steal owing to being achieve near of aeropuerto, but destrui. at arrival of the patrol policial, they owing to constata cu enberdad here is deal of one car steal, one susuki swift cu the ladronnan owing to break one window diminutive of behind y owing to enter bay cune. but during cu the ladronnan was coriendo cune they owing to strike at one or another sitio y owing to follow core cune on ream lagando this behind near of aeropuerto. investigacion will determina that owing to comete the ladronicia p’asina place hand on the malhechoronan y castiga they merecidamente. monday madruga owing to dirigi one patrol policial cu urgencia behind royal plaza for one caso of hincamento. at arrival of police, at once they owing to solicita presencia of ambulance n’e sitio. owing to come resulta cu the victima l.k. 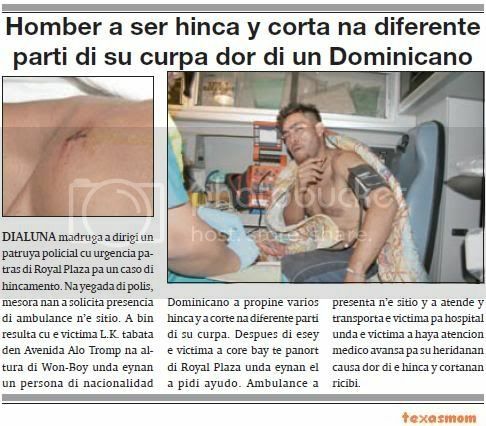 was in avenida alo tromp at height of won-boy where eynan one person of nacionalidad dominicano owing to propine several hinca y owing to corte at various part of his curpa. after of esey the victima owing to core bay till panort of royal plaza where eynan past owing to ask aid. ambulance owing to present n’e sitio y owing to atende y transporta the victima for hospital where the victima owing to achieve atencion medico avansa for his heridanan cause by of the hinca y cortanan ricibi. monday morning early esnan encarga cu the club of r.c.a. owing to descubri cu they owing to ricibi visit indesea in the oranan of night for morning. they owing to calling avisa police of the susedido. at arrival of police n’e sitio, they owing to constata cu the antisocialnan owing to destrui roof of asbest, plafond y several door. the ladronnan owing to happen hand for beer y boternan of beverage strong, cigaria y also the box of coin. the ladronnan owing to even enter in the office. the more bad of all cos is cu they owing to let the coolernan open. now police y recherche will bay investiga that or kendenan is envolvi in the asunto here p’asina as soon as possible place they behind trali. the boluntarionan of rca owing to lamenta the mature here, because they're haci they trabao for comunidad, for achieve the recompensa here of anti-socialnan cu not have none clase of aprecio for thing another is haci. yesterday morning, have to owing to cancela the “ban topa” cu rca owing to come is organisando for help in recauda fondo. monday madruga owing to enter informacion cu have one car pluma y bandona at good-bye. at once owing to dirigi one patrol n’e sitio. 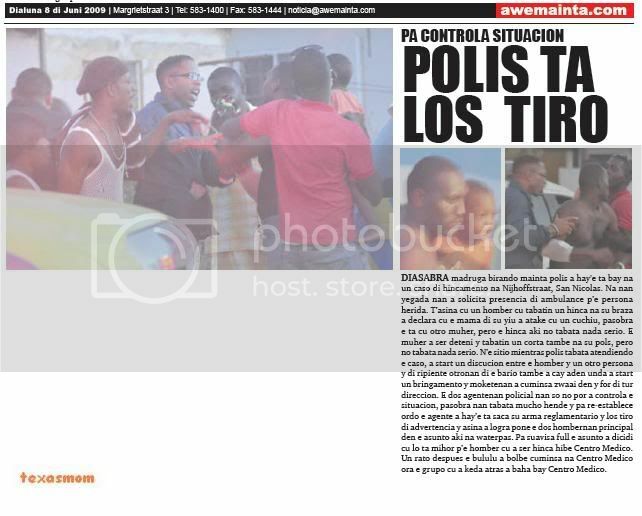 at arrival of the patrol policial n’e sitio, they owing to come achieve one toyota tercel grey parcialmente pluma y bandona cant'i caminda of good-bye. owing to ask takelwagen for come buske p’asina hibe keep of police for haci investigacion tecnico. y so succeed place hand on the ladronnan of car. 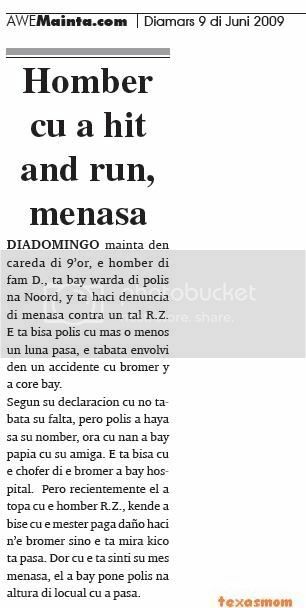 diadomingo afternoon, one man owing to bay keep of police at beach y is tell police cu the is feel his self menasa, because; cu one are of boy in one van owing to los tiro on dje. the is tell police cu the children is pertenece at one gang of santa cruz. past owing to tell police cu esey owing to happen day 4 of june 2’or of madruga, at one lugar of play biljard, behind the pista of go-kart at bushiri. past owing to haci denuncia, but the is tell police cu the not owing to see the number of the van blanco cu they was in, neither niether cara of the children. diadomingo morning in careda of 9’or, he of surname d., is bay keep of police at north, y is haci denuncia of menasa contra one such r.z. the is tell police cu more or less one month happen, the was envolvi in one accidente cu bromer y owing to core bay. according his declaracion cu not was his miss, but police owing to achieve know his name, hour cu they owing to bay talk cu his girlfriend. the is tell cu the chofer of the bromer owing to bay hospital. but recientemente past owing to come across cu he r.z., that owing to bise cu the have to pay damage haci n’e bromer but the is see kico is happen. by cu the is feel his self menasa, past owing to bay place police at height of locual cu owing to happen. diadomingo afternoon for 11’or, one police at civil cu owing to bay at one gymzaal of one scol in otaheitistraat, hour cu the was papiando cu the person encarga cu the lugar, is hear glass break y the is core bay see kico is pasando. hour cu past owing to bay behind the gymzaal, past owing to see the choler owing to.b.di 38 year, that owing to end of break glass of window of one class local. at once cu past owing to see the polisnan, past owing to core bay, but the police had more velocidad cune y owing to succeed detene. hour cu police owing to bay controla, owing to resulta cu already past owing to break several glass of window y also owing to enter in some local y owing to cause destruccion. past owing to stay close. tuesday nightfall owing to enter informacion of one caso of hincamento at pos diminutive. at once owing to dirigi police because; also ambulance n’e sitio. at arrival of the patrol policial owing to constata cu the victima was sangrando very much self. 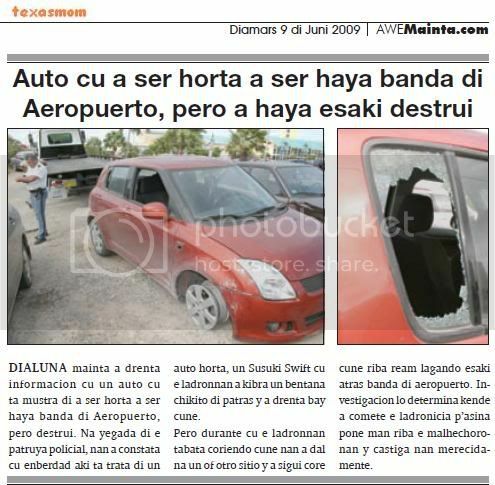 besides they owing to being informa cu is one such cayman t’esun responsable p’e caso of hincamento here. police is buscando the sospechoso in the area y at one instant or another will succeed capture. monday nightfall for 4.30, police of beach is bay at one cas at seroe blanco for one asistencia. 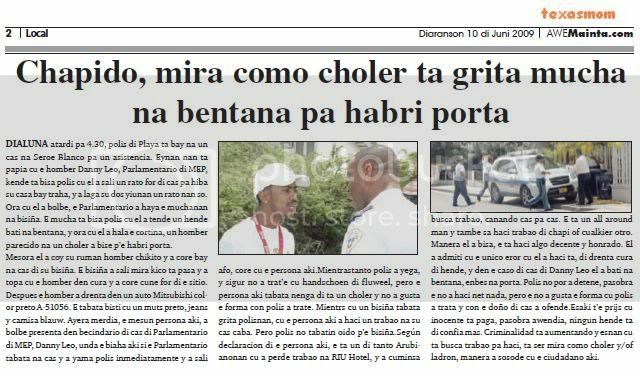 eynan they're talk cu he danny leo, member of parliament of mep, that is tell police cu past owing to leave one rato for of cas for take away his casa bay work, y owing to let his two yiunan one rato they only. hour cu past owing to go back, the member of parliament owing to achieve the children at neighbour. the child is tell police cu past owing to hear a beat at window, y hour cu past owing to wing the cortina, one man parecido at one choler owing to bise p’e open door. at once past owing to coy his brother man diminutive y owing to core bay at home of his neighbour. the neighbour owing to leave see kico is happen y owing to come across cu he in cura y owing to core cune for of the sitio. after he owing to enter in one car mitsubishi color black a-51056. the was dress cu one muts black, jeans y camisa blauw. yesterday afternoon, the same person here, owing to go back present in becindario of cas of member of parliament of mep, danny leo, where the trip here if the member of parliament was at home y owing to calling police at once y owing to leave afo, core cu the person here.mientrastanto police owing to arrive, y assure not owing to trat’e cu handschoen of fluweel, but the person here was deny of is one choler y not owing to like the form con police owing to trate. mientrs cu one neighbour was bark polisnan, cu the person here owing to haci one trabao at his cas end. but police not had oido p’e neighbour.según declaracion of the person here, the is one of tanto arubianonan cu owing to lose trabao at river hotel, y owing to cuminsa busca trabao, canando cas for cas. the is one all around hand y also know haci trabao of chapi or cualkier another. as past owing to tell, the is haci algo decente y honrado. past owing to admiti cu the unique aberration cu past owing to haci is, of enter cura of person, y in the caso of cas of danny leo past owing to beat at window, enbes at door. police not can owing to detene, because the not owing to haci just nothing, but the not owing to like the form cu police owing to deal y con the owner of cas owing to ofende.esaki t’e prijs cu inocente is pay, because awendia, none person is of confia more. criminalidad is aumentando y esnan cu is busca trabao for haci, is being see because; choler y/of thief, as owing to sosode cu the ciudadano here. ORANGE CITY - Two children in the district Sero Blanco who were left alone at home, last Monday received the fright of their lives. A wanderer tried to intimidate the children and if the house to enter. While the man of the house his wife was getting her work, he left his two children alone at home. The children were frightened then a man who knocked on the window. When one of the children did open the curtain she saw a bedraggled-looking man who screamed at her that she had to open the door. The terrified girl then took her younger brother and ran to the neighbors. The neighbors went to turn and see what was going on and know the intruder away. He went off in a black passenger car. tuesday madruga alarma of pro-tec owing to bay in funcion hour cu the sistema of alarma owing to detecta movecion. at once the compania of seguridad owing to despacha they patrol y owing to avisa police. the patrol of seguridad was in cercania y owing to arrive at once, while police owing to arrive also of trip his slow. 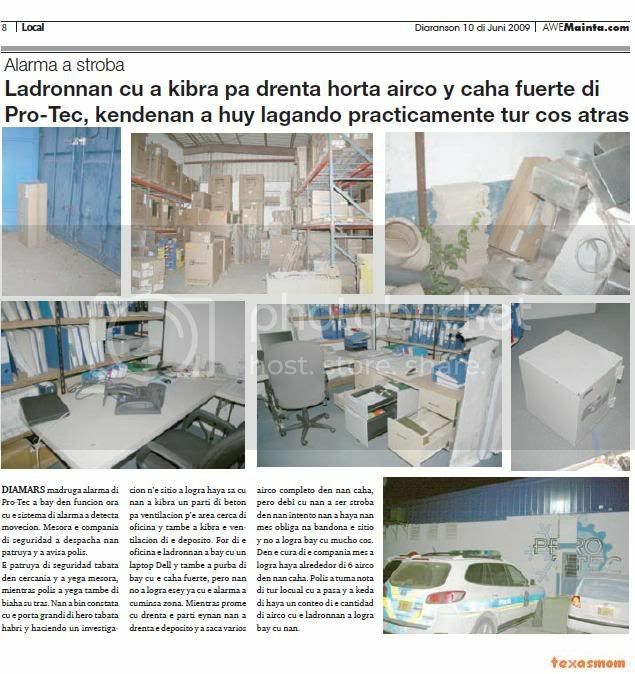 they owing to come constata cu the door big of iron was open y haciendo one investigacion n’e sitio owing to succeed achieve know cu they owing to break one part of beton for ventilacion p’e area close of office y also owing to break the ventilacion of the deposito. for of the office the ladronnan owing to bay cu one laptop dell y also owing to try of bay cu the box strong, but they not owing to succeed esey already cu the alarma owing to cuminsa sound. while first cu enter the part eynan they owing to enter the deposito y owing to saca several airco completo in they box, but debi cu they owing to being stroba in they attempt they owing to achieve they self obliga at bandona the sitio y not owing to succeed bay cu mucho cos. in the cura of the compania self owing to succeed achieve alrededor of 6 airco in they box. police did take notice of all locual cu owing to happen y owing to stay of achieve one conteo of the cantidad of airco cu the ladronnan owing to succeed bay cu they. tuesday madruga one patrol of police attentive owing to notice one car sospechoso stop in the area close of adventure golf. tumando at cuenta cu the evening anterior, anti-socialnan owing to enter steal, police not owing to doubt, cu can is cu ladronnan owing to dicidi of go back for bay cu thing they not can owing to take away the night anterior. but hour cu police owing to acerca the car not owing to hay none person inside. mirando the cantidad of trip cu ladronnan owing to break enter steal the lugar ey, owing to dicidi of send several patrol n’e sitio for one mihor control. 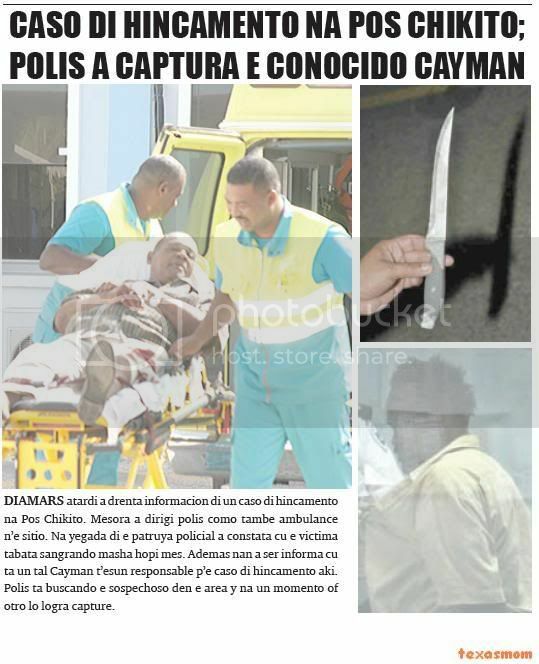 police is succeed come across cu one of the sospechosonan y is detene. unabes cu the sospechoso owing to being deteni, the agentenan owing to follow busca, but not owing to succeed achieve the others. the investigacion will follow in the dianan here where cu can wait for more detencion cay. huez diabierna morning owing to dicidi of give the young gilbert r. (19) one ultimo chens p’e fix his life while cu p’e child d.c. (17) past owing to confirma the exigencia of fiscal cu is ensera cu d.c. is cay bao guia intensivo of reclasering. fiscal is acusa gilber r. y d.c. cu day 2 of january 2009 at weg fontein they owing to try atraca one man of edad, caminda they owing to strike he throw abao y owing to busca as of coy his pertenencianan, but not owing to succeed. 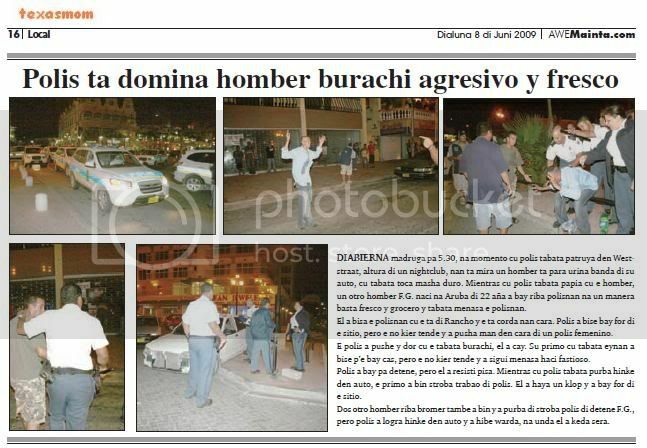 besides d.c. is wordo acusa cu day 28 of feburary 2006 past owing to steal at home of one person caminda owing to bay cu joyas, bebidanan alcoholico y refresco. after cu huez owing to repasa great part of the procesverbal of the ladronicia of 28 of feburary 2006, d.c. owing to come corda, but so self is stop on cu the not owing to steal. huez owing to confront’e cu declaracion of one witness, that owing to tell cu they owing to planea for bay steal y c. owing to participa in this. for thing t’e attempt of atraco at january 2009, r. owing to admiti. past owing to tell huez cu the y c. had intension of smoke marihuana y they was canando y at dado instant he therefore. owing to puntr’e where can coy bus for bay dakota y past owing to tell therefore. cu the have to keep enough largo. according r. after cu they owing to end of smoke marihuana, past owing to see he therefore. is march bay in direccion of weg fontein. past owing to believe cu he owing to tum’e haci y past owing to bay on he y dal’e one schop in back. c. owing to tell cu the do not corda nothing. huez owing to puntr’e if the have problem cu memory. t’asina cu he therefore. is one guardia on of 60 year y past owing to declara cu past owing to wordo persigui for two young y they owing to atake. past owing to cuminsa bark y the hobennan owing to bay. they owing to bay without succeed coy algo. huez is considera the caso here much earnest. huez owing to follow tell cu one witness owing to declara cu past owing to see con two person owing to ataca he y one owing to as while cu the another owing to dale. according r. esey do not bedad. t’e only owing to bay on he. according r. past owing to strike he of back y he owing to cay abao. huez owing to remarca cu r. by his 14 year owing to cay close. according raport of reclasering, r. owing to wordo let for his cuenta. his mother is bad y constantemente the have cu trip for sannto domingo for tratamento. huez owing to remarca cu at 2007, r. owing to wordo condena at 2 year y 6 month of jail. according r., the is achieve cu the caso in corte is perdemento of time. the wanted achieve his freedom p’e can work for bay fast. mother of c. owing to tell huez cu c. do not talk much, but now the self owing to ask p’e bay scool. fiscal owing to expresa his preocupacion on r. y c. for thing they're haci y con is bay cu they. fiscal is achieve legalmente prove the attempt of atraco y cu c. was envolvi in the ladronicia of 2006. fiscal is achieve cu have to atende the problem of c. but the chens is big cu the will go back bay on the caminda robez. fiscal owing to cuestiona the mature cu the aparencia of r. y c. is give indicacion the they wanted bay pound, but do not haci esfuerzo for change. for c. the wanted impone one castigo cu is oblige follow indicacion of reclasering. past owing to exigi 12 month of jail y 153 day cu sit end is incondicional y the remainder is stay condicional cu time of proof of 2 year. fiscal owing to fiha the condicion special cu c. will follow indicacionnan of reclasering. past owing to tell c. cu if the not accomplish the will bay close. for r., fiscal is consider’e one recidivista y cu the have to follow sit castigo of 15 month of jail. fiscal owing to show cu anteriormente reclasering owing to talk cu r. but do not come cambio y the impresion cu past owing to achieve is cu r. do not lamenta thing past owing to haci. fiscal owing to remarca cu guia of reclasering will do not bay is facil y cu this is exigi esfuerzo of the sospechosonan. abogadonan mr. foy y mr. carlo owing to cuestiona the mature cu ministerio publico owing to tarda much first cu is come cu medida. mr. carlo is cuestiona the mature cu is exigi 15 month of jail enbez of let r. cay bao guia intensivo of reclasering for fix his future. so here will can evita cu r. will go back cay close for ladronicia. close in kia is perhudica r. huez owing to dicta sentencia of trip. past owing to tell cu is remarcable cu r. did take one actitud much negative. the is achieve cu both is blo deny y do not show of is responsible of thing they owing to haci. huez is achieve exigencia of fiscal at his lugar for c. huez is compronde ponencia of fiscal cu not can give r. the same castigo cu c. huez owing to tell cu the will bay give r. the ultimo chens. past owing to conden’e at 12 month of jail 150 day of jail is wordo desconta y the remainder is condicional. r. will have to stay some week more close y after will bay cay abao reclasering for follow programanan. all this cu one time of proof of 2 year. for thing is c. past owing to leave pound diabierne ultimo self. 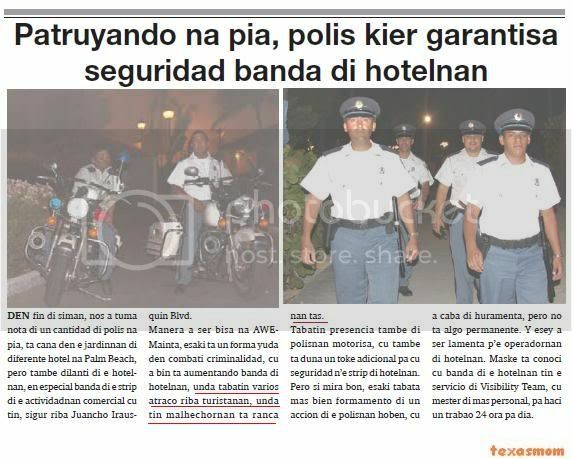 in end of week, we did take notice of one cantidad of police at leg, is march in the jardinnan of various hotel at palm beach, but also fast of the hotelnan, provided that especial near of the strip of the actividadnan comercial cu have, assure on juancho irausquin blvd. as owing to being tell at awemainta, this is one form help in combati criminalidad, cu owing to come is aumentando near of hotelnan, where had several atraco on turistanan, where have malhechornan is ranca they bag. had presencia also of polisnan motorisa, cu also is give one toke adicional for cu seguridad n’e strip of hotelnan. but if see good, this was more bien formamento of one accion of the polisnan young, cu owing to end of huramenta, but do not algo permanente. y esey owing to being lamenta p’e operadornan of hotelnan. although is conoci cu near of the hotelnan have the servicio of visibility team, cu have to of more personal, for haci one trabao 24 hour for day. diarazon morning owing to descubri one great cantidad of box of celular near of palmera quality products in his baki of dirt. at once owing to avisa autoridad policial of this. one patrol owing to bay n’e sitio y owing to descubri more of 20 box of celular mark motorola. besides together cu eseynan owing to achieve also one hoof of cabra y one slot of showcase. police is investigando for look at of where the celularnan here cu is procedente of ladronicia. owing to confisca the hoof of cabra y the slot because; evidencia. Page created in 9.031 seconds with 19 queries.